As part of this Rhino Expansion & Risk Reduction Project and Lion Watch Project we plan to move a number of Rhino to an interim reserve, as well as relocate a number of our rescued Lions to their new semi-wild habitats. This unique and exciting experience is one not to miss! Join this Volunteer Assistance team and be part of the bigger picture for these iconic African creatures. As part of a Rhino Expansion & Risk Reduction Project and Lion Watch Project we plan to move a number of Rhino to an interim reserve, as well as relocate a number of our rescued Lions to their new semi-wild habitats. Rhinos are under major threat from poaching and their numbers are declining at an alarming rate. The methods used by the poachers has become more violent and destructive than ever before and it is vital we look for alternative areas to keep them safe. 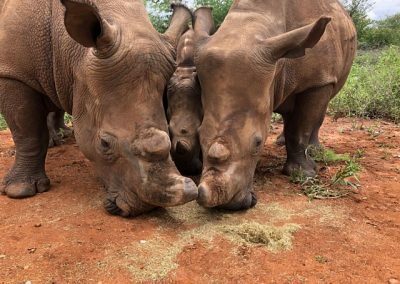 Our ultimate goal is to move the Rhinos to our Sanctuary in Botswana where they will be safe and free, in a country that is considered one of the safest in the world for free roaming rhinos. However, in the interim period we need to move them away from their current location to a different, safer reserve and prepare them for their final journey. 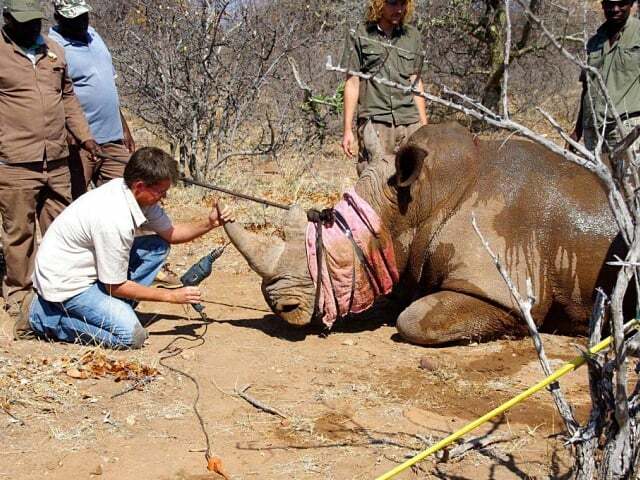 The rhinos currently live on game reserve 400km away and using a helicopter the veterinarian will dart (sedate) them. Once the rhino is down, the vet will do an overall check-up for any problems and issues. Females will also be checked for pregnancy with ultrasound. While they are still under sedation we will fit a tracking collar to the foot, surgically remove the horn and insert microchips. Once all vet work and operations have been completed, the rhinos will be loaded into transport crates and transported by road to their new home. After a few days of recovery in the Boma, the rhino will then be released onto the main reserve to be free roaming with our intensive monitoring and anti-poaching unit! 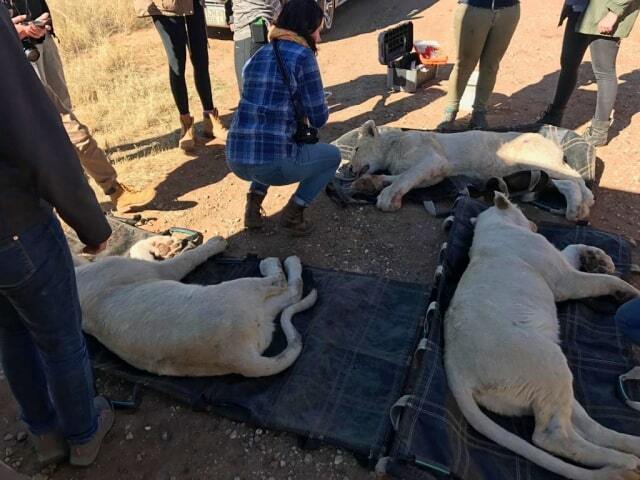 In 2018 we rescued 44 Lions from a Canned Hunting/Breeding facility where they were kept in horrendously, cramped conditions and severely malnourished. Over the last few 6 months we have worked tirelessly to give them the life they deserve, roaming in safe, semi-wild environments where they can live out their days. Unfortunately, due to their captive breeding these lions will never be able to be released in to the wild. With some of the large semi-wild enclosures now ready we will be moving a number of lions, by road, 60km to the reserve where they will remain. 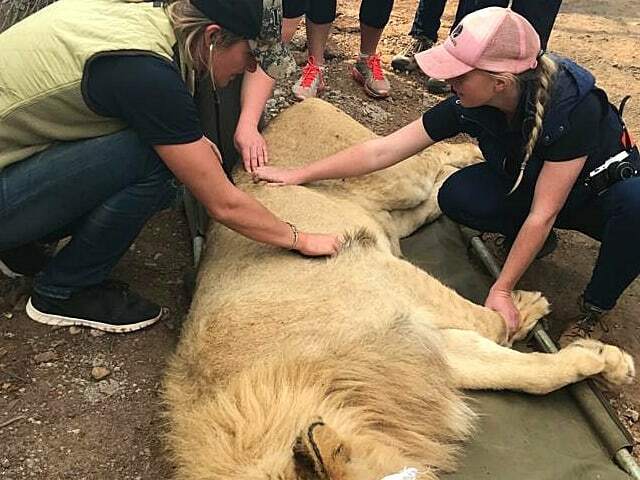 Prior to the move, behavioural observations will be made to determine strong relationships between individuals within the large groups, these lions will be moved together. The selected Lions will be sedated (by dart) and checked over by our Vet. We will also treat them for ticks and worms as well as insert a micro-chip before loading them into transport crates. Each set of dates will include a Rhino relocation and a Lion relocation within the 2 week period. Day 1 & 14 will be a transfer for arrival & departure to Polokwane. Introduction and Lectures regarding project, Vet Lecture, Safety Procedures and Protocols for the whole project. The whole group will travel to the new reserve and assist with final planning and work to ensure all is ready. This will include checking the entire reserve fence, the recovery camp, water points and all equipment. Then we will travel to game reserve where the rhino currently roam. This journey will take around 4 hours by road with an overnight stay. 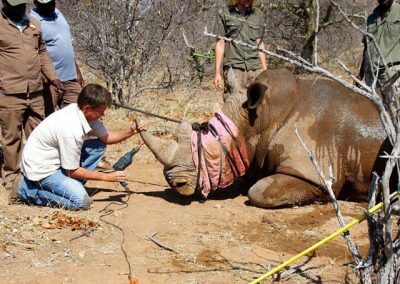 A helicopter will take off at first light to locate the rhinos and the vet will dart the rhino from the air. Once the rhino is down under sedation everyone will have a different task (i.e. fitting radio collar, ear notching, surgical dehorn, inserting microchips under skin and in horn, pregnancy checks with ultra sound). When all work is complete we will load the rhino into the transport trailer and the convoy will begin back to the reserve. We will immediately offload the rhino into the recovery camp as we arrive. The vet will do final check and we will check the radio tracking equipment. We will then continue to monitor the rhino in the camp to ensure safety over the next few days. Final check of whole perimeter of new reserve, waterhole checks, radio collar check. We will then release the rhino onto the main reserve. Introduction and orientation of the LionWatch sanctuary in Alldays. Assisting with final plans for the move and formulating groups for the behavioural observations. Final checks will be made to the new enclosures, electric fencing, water holes, supply of food. 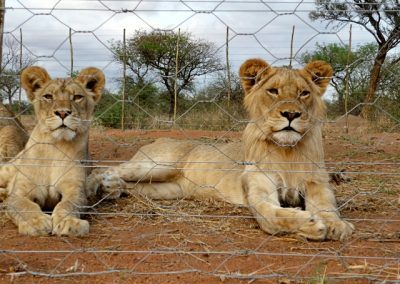 Behavioural observations and general duties around the sanctuary will take place, this will include feeding, cleaning out enclosures and general maintenance. Early morning the Vet will sedate the selected Lions and carry out the necessary checks. We will then insert the microchips and carry out deworming and tick treatments. 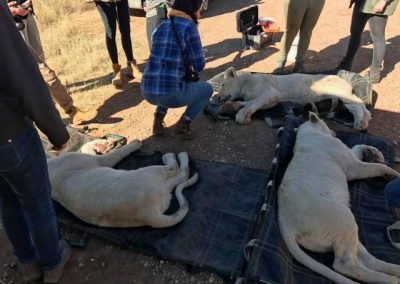 When all work is complete we will load the lions into the transport crates and the convoy will begin back to the reserve. We will immediately offload the lions into their new enclosures and the vet will carry out final checks. Monitoring and general duties of all lion camps. Please note that this schedule is subject to change should the project require. This unique and exciting experience is one not to miss! The money raised through this project will ensure the safety of our Rhinos, paying for the much needed intensive monitoring and anti-poaching units, as well as allowing our rescued Lions to live out their days in the beautiful African bushveld which they so deserve. Opportunity to relax for 2 nights at our Private Game Reserve in Botswana located on the Limpopo River. This will include your accommodation and food for the weekend. You can join a game drive, both day and night, experiencing a variety of African wildlife such as Elephants, Lion, Wild Dogs, Leopard, Hippo, Giraffe and an array of Antelope and Bird species. Accommodation: On a sharing basis at various locations, mainly Unkwali Bush Camp, South Africa. Included: transfers from/to Polokwane, accommodation and 3 meals per day. Accommodation: On a sharing basis at various locations, mainly Unkwali Bush Camp, Alldays. Requirements: No qualifications necessary. Must be open-minded and dedicated to the cause. As part of our Rhino Expansion & Risk Reduction Project and Lion Watch Project we plan to move a number of Rhino to an interim reserve, as well as relocate a number of our rescued Lions to their new semi-wild habitats. I am aware that a financial contribution is required to take part in this project.